Web4Africa Review 2019: Is Web4Africa a Good Hosting? Established in 2002, Web4Africa is an African hosting provider with pocket-friendly hosting solutions for businesses in the region. The company’s greatest undoing, however, is their customer support. Web4Africa was founded in 2002 to serve African companies with affordable web hosting solutions. They have a significant presence in Africa, but their reach has also extended to North America. Over the years, Web4Africa has served over 40,000 customers from more than 120 countries. They operate out of four data centers located in Ghana, South Africa, and Nigeria. Note that the free domain name is only available when users subscribe to annual plans. What’s more, customers who buy the vendor’s most basic annual plan are limited to free domains with these extensions: .com.ng, .org.ng and .co.za. Web4Africa’s dedicated server solutions are powered by Cisco network equipment and Dell server hardware with hardware RAID configuration. These are available from data centers based in Ghana, Kenya, Nigeria, and South Africa. As is typical of dedicated servers, you can choose your preferred operating system from several options: CentOS, Debian, Ubuntu, and Windows Server. Perhaps because of their large size, many Web4Africa customers complain about the company’s failure to alert customers about changes in the user interface or the expiration of their services. These changes can frustrate webmasters, especially those that are not very familiar with hosting and the various interfaces available. Plus, when these alerts do happen, they are extremely irregular and often unhelpful. What’s more, it’s not uncommon for customer websites to disappear altogether with no explanation. Web4Africa doesn’t seem to take responsibility for these mishaps. In addition, while this vendor boasts of powerful servers in several African countries, many users complain of slow servers, sometimes having to wait as long as 30 minutes for a page to load. The vendor has also yet to put enough resources into securing their system, making their customers’ websites vulnerable to hackers. Web4Africa has very affordable hosting plans, especially compared to their competitors in the region. The basic plans, however, have notable restrictions and might force you to upgrade to a more expensive plan later on. For many businesses, the big advantage of using this vendor is the fact that their data centers are located in several African cities — a factor that affects website speeds and search engine rankings. That said, this means that customers from outside Africa, especially those in North America, could find themselves struggling with even slower loading speeds because the vendor doesn’t have any servers in that continent. Web4Africa encourages their customers to use email to contact their support team, but there are also several other ways you can get in touch with them, including their contact form, ticketing system, and telephone. Disappointingly, the company has no live chat and their knowledge base is not very comprehensive. To make things worse, Web4Africa’s support team is extremely slow to respond to queries. I opened a ticket and seven days later I still hadn’t received a response. What’s more, they closed my ticket without ever communicating to me or resolving the issue I’d raised. When I sent them an email to follow up, they sent me back what looked like a copy-and-paste response, suggesting that their support team doesn’t have the expertise or the experience necessary to resolve technical issues. Although at first glance Web4Africa looks like an excellent web hosting vendor for businesses across Africa, the company’s failure to streamline their technical support system remains their greatest undoing. 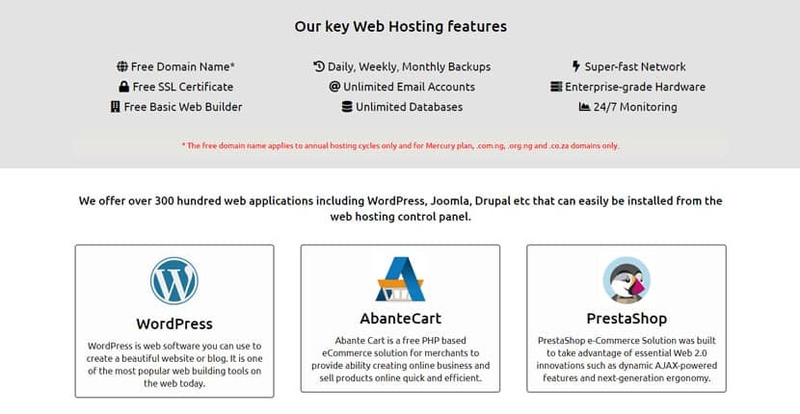 Wondering how Web4Africa stacks up against other Web Hosting companies? Enter any other Web Hosting company and we will give you a side-by-side comparison.